Hot property: Gary Darna moved CompleteSet into its own Cincinnati HQ. When Gary Darna and Jaime Rump secured $650,000 in seed funding for CompleteSet, the online collectibles marketplace they founded in 2012, they were happily operating in a co-working space provided by Cincinnati startup catalyst Cintrifuse. But the pair soon realized that the growth sparked by that cash would require a move to something bigger. It’s a familiar scenario to many startups: The first months (or even years) are often executed from the couch, basement or kitchen table. But as the business grows, it’s time to move -- and where you go is important. Your location can affect your company’s productivity, creativity and community, not to mention budget. Insiders agree that choosing the right environment depends on the work that’s being done and the people who are doing it. Before you commit, consider the pros and cons of four kinds of workspaces. The Framebridge team in its D.C. space. One of the first places startups turn to when looking for a “real” office (i.e., not the living room) is a co-working space shared by other small businesses. While co-working was no longer an option for Darna, many find that working in shared space has distinct advantages. Don Lam, managing director of the Bay Area region for IA Interior Architects, says it’s a great way to spark community and innovation among startups. That’s just what Scott Barron found while operating in a co-working space. “Listening to what other people are doing can spark an idea or conversation, and other opportunities can arise as well,” says the CEO of Alpharetta, Ga.-based School Growth, which provides professional development programming for schools and school boards. Barron once discovered he shared a client with someone across the room, which allowed them to combine efforts for the benefit of both startups as well as the client. Another time, a fellow group from the co-working space helped Barron solve a problem that they had already dealt with. “That completely short-circuited our learning curve,” he says. But co-working spaces don’t work for everyone. Susan Tynan, founder and CEO of Framebridge, an online framing company based in Lanham, Md., set up her team of five at a co-working space when she launched in 2014 but realized almost immediately it was not right for the daily operations of her business. If privacy is an issue, you may want to look elsewhere, adds Lam, who notes that a shared space has the possibility of compromising intellectual capital. “For a startup, confidentiality is huge,” he says. Barron’s experience in a co-working space has been positive. And because he and his employees travel so much, he has determined that a fixed space would not be a worthwhile expense. His five-person central team works from home in addition to a shared space. “Having space that contributes to your value proposition is more important than feeling like you have a cool space,” Barron says. Like shared office space, setting up shop in a shared manufacturing environment can work for many startups. Julia Payne Cooper, senior workplace specialist in the Seattle office of design, architecture and engineering firm HOK, says the majority of her clients who locate their offices alongside their manufacturing spaces have seen benefits, including an increased speed to market for product and faster access to information and decision-making. “Taking down the boundaries between what is being made and how it’s being made is very key,” she says. When those spaces are shared with others, however, problems can arise, as Andrew Royce Bauer, CEO of Royce, a Secaucus, N.J.-based handbag and accessories designer, experienced. He says nondisclosure agreements between the factory he operates in and other designer brands in the space have made the setup less than ideal. Experts say dedicated space offers an ideal environment for startups to nurture their burgeoning brands, as well as their own work culture. Because a company’s values are implied in the choices made about its environment, having an office lets founders take ownership of their brand in a way that shared space doesn’t allow. That was Tynan’s goal when she moved the Framebridge corporate team into a historic building in Washington, D.C.’s Georgetown neighborhood that she believes is a perfect environment for her brand. Dedicated space also enables a business to build corporate culture by creating an environment that’s an expression of who the founders are. “Whether you’re passionate about sustainability and well-being or want to attract a surfer-dude culture, once you identify the culture you want to create, having your own office lets you embody that culture in your space,” Lam says. Elizabeth Holmes, co-founder and CEO of Orlando, Fla.-based PawsLikeMe, has found this to be true, and will plan her next move accordingly. 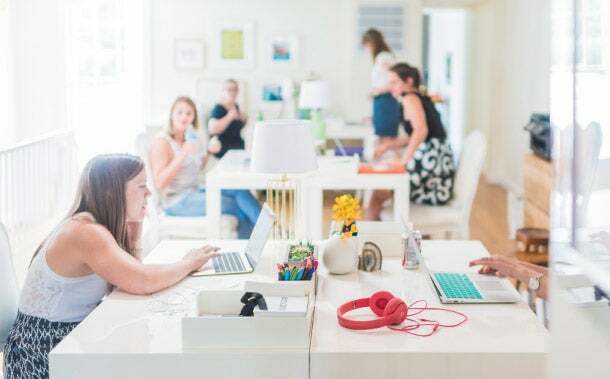 Launched in 2014, the online matchmaking site for people and pets recently joined a co-working space that allows the team of five to be face to face more often and less dependent on technology to connect. Those who have their own offices might consider an open-concept space, a hallmark of entrepreneurship because having visual and physical access to colleagues can help foster innovation and collaboration. HOK’s Cooper adds that another perk of open offices is better access to natural light for more people. “Research shows that when you give daylight and diverse views to the greatest number of people, it has a big impact on their alertness and well-being, which in turn affects their ability to be effective and innovative,” she says. Mark R. Leary, professor of psychology and neuroscience at Duke University in Durham, N.C., says that while the movement toward open spaces and “social collision” can improve creativity, different spaces are needed for different work functions. And while many ’treps claim to love the open concept, there’s plenty of research to suggest it’s not all it’s cracked up to be. A University of Calgary study published in the journal Environment and Behavior found that people who moved from a traditional office to an open-office layout reported decreased satisfaction with the physical environment and co-worker relations, and increased physical stress. Research published in the Scandinavian Journal of Work, Environment and Health found that open-office workers take roughly 62 percent more sick days than those in single-occupant layouts. That’s why Leary says taking the time to understand how your employees work best can go a long way in choosing the right space. For example, extroverts are energized by constant stimulation and interactions, whereas introverts are depleted if they are thrown into overstimulating environments.